This gorgeous, modern semi-detached villa offers 4 bedrooms (3 en-suite) and private pool. Three of the bedrooms have partial sea views; two have outside terraces. The piece de resistance is the gorgeous roof top terrace with views of the sea, mountains and Port Andratx. This includes a hot tub, outdoor shower, 8 person dining, informal seating area, and BBQ. This 2nd line villa also offers sea access within a short 50 metre walk. Other features include internet access, tiled garage with pingpong, air-conditioning, English TV channels and filtered water system. Large modern kitchen with breakfast bar (seats 3) and dining table (seats 8). Dishwasher, American fridge/freezer, range cooker, microwave, osmosis water filter. Adjacent pantry houses washer/dryer. Sliding glass doors access pool area. Ten minute drive to Camp de Mar Golf Course. Five other golf courses within 15 minute drive. Over 20 golf courses in Mallorca in total. We had a fantastic holiday in this 5 star villa. Everything was exactly as outlined. Brilliant living space, great kitchen that is fully equipped. Lovely pool and simply amazing roof terrace. Watching the sunset in he Jacuzzi as the boats drift into the port is a memory we will hold for ever. Communication was first class from the moment of booking. Highly recommended. We know the area well and enjoyed our stay very much. The only Villa criticism we would make is the dreadful smell that comes from the drains which needs to be sorted. A minor point mentioned by a previous occupant is that the roof terrace could do with some shelter. We have stayed at this property before. We particularly love the location, quiet and away from the bustle of the Port but close enough for a 10/12 walk into town every day/night. Since our last stay the roof terrace has been completely refurbished and we loved it. We were met by Cindy who manages the property and who gave us a warm, friendly and efficient welcome. The swimming pool, terrace and house were all very clean when we arrived. Our only comment would be that the kitchen could be better equipped. Not everyone wants to cook when they are on holiday but if you do I felt there were some kitchen items missing. All in all though we had a lovely stay and will definitely be back! Superb villa in a superb location. Ideal for families. Lovely pool, table tennis table, jacuzzi and roof top dining with a view of the port. Easy parking outside. 10 minute amble down to the port. Cindy showed us in and was very welcoming and enormously helpful. The owner, Suzanne also extremely nice and easy to deal with. Thank you. Beautiful villa - fantastic views on roof terrace. We loved our stay in Port Andratx. Great port with lovely restaurants and the villa had everything we needed. The port is walking distance from the villa so great for evening meals and drinks. Would definitely go back! Beautiful views and easy level walk to harbour in about 10 minutes, walking slowly! It was too hot during the day to sit on the roof terrace and it would be great to have some shade up there. The beds were a touch hard for my liking but we all like different beds! 50 metres walk to access to sea. Tiny beach in Puerto Andratx. Small secluded calas to be found and explored nearby. 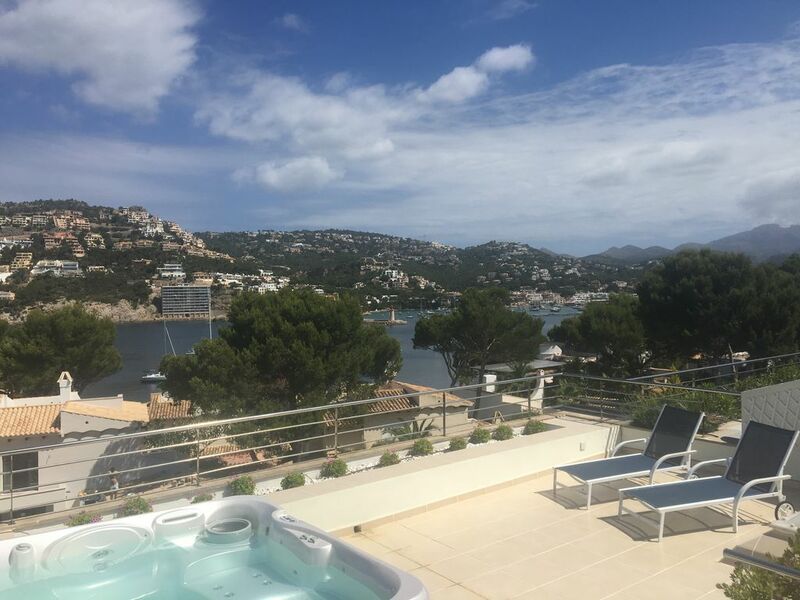 Large, developed, sandy beaches 10 minute drive away, include Camp de Mar, Peguera, Santa Ponsa and Sant Elm (ferry and bus services also available). The villa is about a 20 minute drive from Palma and 30 minutes from the airport. The restaurants, boutiques and shops of chic fishing village Port d'Andtratx are 500 metres from the villa. Unique location with easy (less than 10 min) walk to harbourside restaurants. World class golf courses and tennis facilities within 10 minutes drive. Other activities include diving, walking, sailing, cycling, fishing, wind-surfing and water skiing. Local cafes, boutiques, restaurants, supermarkets within 10 minutes walk. Booking Notes: £500 per week due at time of reservation - this will be held as a security/damage deposit and returned after holiday is complete (if no damage nor cancellation). 100% of booking due 60 days before time of travel. Changeover Day: Changeover day is flexible but usually saturday. Arrival 4pm and checkout 10am. Notes on prices: Prices are for the property per week in UK Pounds. Daily rates are negotiable. Discounts for long-term off-season rentals.